The ultimate comfort food grilled pizza! The best pizza is made from your grill, and tastes terrific! Pre Heat the grill: You should heat it quite hot; my grill was about 400°F with the lid on while baking this particular pizza. If you have a choice on your grill between direct and indirect heat, set it up so the pizza is over indirect heat. Prep your dough: It should be stretched or rolled out into a thin circle. Sprinkle garlic powder on the dough just before placing it on the grill. Cook the pizza dough on indirect heat for about 10 minutes to firm up the dough. 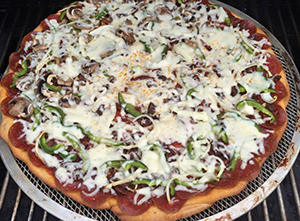 Remove pizza dough from the grill and add your pizza sauce and toppings. Grill the pizza until the crust becomes golden brown and all the toppings are heated thoroughly. Add cheese to the top of the pizza until it melts into the toppings. Remove pizza from the grill, cut pie or square shapes and server hot. Every grill is different! You know your grill and it cooks differently than mine. Your pizza may take longer or shorter depending on how hot the grill gets and where your areas of direct and indirect heat are. Cooking times will vary! Keep an eye on the grill heat.